Keith Beattie’s Documentary Display: Re-Viewing Nonfiction Film and Video is an extremely valuable and refreshing contribution to the burgeoning field of documentary film studies. Beattie’s book takes as its focus elements of documentary form and practice that are somewhat undervalued and often criticised in much of the dominant writing on and theorisation of the field. Beattie takes particular exception to the governing significance and gatekeeping role of such figures as John Grierson and Bill Nichols, and the ways in which their ideas have formed and stunted categorisations and definitions of documentary, often promoting a series of aesthetic and ethical boundaries that have demarcated “proper” and “accepted” documentary practice and example, while also devaluing and questioning the poetic, embodied and individuated forms and responses that Beattie brings to the fore. Underlying Beattie’s argument is also a distaste for what he calls “didactic” documentary (and the often dry theoretical work and straitjacketing categorisations associated with it), and a favouring of documentary forms and individual titles that are polymorphous, impure, outwardly spectacular, and poetic. In its early sections, Documentary Display reframes non-fiction cinema in terms of what Tom Gunning, discussing early cinema, has called the “cinema of attractions” (while still examining the political, social and historical engagement of most of the films Beattie covers). This approach immediately acts to both reconsider very early examples of non-fiction cinema and defamiliarise documentary in relation to the qualities and characteristics we most readily associate with the form. In so doing, Documentary Display embraces a range of (often visionary) characters and forms that includes Jean Painlevé (who provides the epigraph for the book), Alby Falzon, D.A. Pennebaker, IMAX, Werner Herzog, Santiago Alvarez, Craig Baldwin, and multifarious forms of distribution and exhibition. Although it sometimes caricatures the pre-existing and dominant approaches of documentary film studies, Beattie’s book provides a considerably more open and embracing definition of documentary form and content, usefully blurring the often morally and ethically restrictive distinctions which define many critical approaches to “non-fiction” cinema and television. It should be noted that Beattie’s book is not meant to be a comprehensive account of documentary, but an attempt to shift the balance towards forms of non-fiction film and television that have generally received short shrift and that trouble common definitions and distinctions. By highlighting the spectacular, sensual, engaged and adventurously aesthetic aspects of such documentaries as Herzog’s Lessons of Darkness (1992), Robert Kramer’s Point de départ (1993), David Elfick’s Crystal Voyager (1973), Kenneth Anger’s Scorpio Rising (1964) (the very act of discussing such a film as a “partial” documentary is itself refreshing and illuminating), and various examples made for the IMAX format, Beattie opens the way for a more dynamic and patently enjoyable approach to and analysis of the form. At the same time, he possibly overvalues some of the examples he has chosen simply because they meet the paradigm he is championing. Although his book is very well-written, I did occasionally wish that more of this openness and embracing of difference and variety had actually crept into the writing; as discussed below, Beattie’s prose is a little straitjacketed by the somewhat repetitive structure his argument takes. But in the context of what Bettie does achieve here, this is a relatively minor objection. By examining such undervalued and sometimes marginalised subgenres of documentary as the city symphony, rockumentary, found footage cinema, the surf film and natural science film, Beattie’s book works to blur the distinctions between documentary and other forms of film practice – too much so when he conflates the documentary “impulse” of some found footage cinema with the form as a whole – as well as emphasising such devalued qualities and aspects of documentary as entertainment, an audience’s emotional and physical response, wonder and “display”. By favouring (or at least highlighting) the practice of “showing” over “telling”, and arguing for the fundamental and foundational basis of documentary (and cinema) in such a process, Beattie provides a cogent and extremely well-researched argument about the necessity of shifting or broadening our commonly value-laden notions of what constitutes a good documentary. Those of us who have long been interested in such forms as the essay film, the city symphony, rockumentary, the nature film, found footage – and perhaps care less for restrictive definitions of even cinema itself – will possibly wonder if this argument (or leap?) still needs to be made, but one only has to consider the documentaries that routinely win awards to realise that long-ingrained approaches to the form, and what is regarded as of true value within it, still hold sway. A central aim of Beattie’s project is to realign documentary with other forms of cinema, particularly in relation to the kinds of emotional and aesthetic responses that the form actually encourages. (So a key aspect of Beattie’s argument is that much documentary theory largely ignores popular instances of non-fiction cinema, like rockumentary.) This goal probably finds its most successful manifestation in the chapters dealing with found footage and the surf movie. Although both areas have received their share of critical discussion, it has rarely occurred within the core debates and definitional frameworks of documentary studies: the surf film has largely been discussed as an esoteric, marginalised practice, while found footage cinema is normally “contained” within the avant-garde. Beattie’s focus acts to both re-illuminate the two areas and expand the domain of documentary and what we might see as its defining characteristics. These two areas are also rich because they each embrace a variety of approaches as well as a degree of ambiguity in terms of the ways in which they are treated and used by the audience. Both forms also suggest a degree of intellectual, aesthetic and physical engagement that exceeds the often civil and social functions of documentary (the fact that both forms also embrace avant-garde techniques is hardly surprising). The great value of Beattie’s book and its argument is that they are situated within existing documentary theory and history. Beattie’s previous book, Documentary Screens: Nonfiction Film and Television (1), provided a somewhat more conventional account of documentary history and practice, but it is a valuable counterpart to Documentary Display as it commenced Beattie’s project of reconsidering the documentary canon (it also contains virtually verbatim passages on Pennebaker’s Don’t Look Back  and Bruce Conner’s A Movie  – another minor quibble). Documentary Display certainly takes such an approach further, and allows Beattie to discuss particular films he obviously has a passion for. At times, Beattie’s prose becomes a little strangled by the level of citation that he deploys in what is, to be honest, a fairly densely argued and relatively short book – each of the areas he discusses really requires its own book and there are several other fields of “documentary display” that could have been discussed (the contemporary fashion and taste for historical re-enactment, for example) – but this reference to the pre-existing work of others (including many of the key names in documentary studies like Grierson, Nichols, John Corner and Brian Winston – the final two much more sympathetically regarded by Beattie) works to highlight the importance and distinction of Beattie’s contribution. Beattie is rarely unwilling to pick an argument with those he feels have too severely limited the definitional and aesthetic realm of documentary (exemplified by the taxonomy that structures Nichols’ Representing Reality) (2). Although Beattie’s account of his chosen forms of documentary is, at times, a little utopic, and a little lacking in its own aesthetic judgements and overvaluing of “fun”, “excitement”, “spectacle” and “display”, it is – surprisingly – bracing in the ways it illuminates particular examples and still pinpoints their political, social and aesthetic importance. Documentary Display is ultimately at its strongest when it engages directly with the kinds of films that the author considers marginalised in accounts of the documentary canon. Although the structure of the book is a little too schematic at times – dealing with each subgenre in turn and working its way through individual examples in a somewhat relentless fashion – it is a generally well-argued and well-written tome which importantly focuses attention on specific films that have received little useful discussion within the mainstream of documentary criticism (and to be honest, this book’s main argument is with this existing theory rather than the form itself, which has always been more varied than commonly suggested). I occasionally wondered whether Beattie’s argument with documentary theory and history is a little overstated, as more commonsensical accounts of the form would embrace many of the examples he discusses. Also, despite its uncommon focus, Beattie’s choice of individual examples – particularly in relation to the rockumentary and found footage – is somewhat predictable, returning to commonly discussed works such as Don’t Look Back, Martin Scorsese’s The Last Waltz (1978), Baldwin’s Tribulation 99: Alien Anomalies Under America (1991) and A Movie. But, as Beattie’s purpose is to place these works and broader forms firmly within the mainstream of documentary practice – or to illustrate that they are really already there – and the definitions and categorisations associated with it, as well as to emphasise and describe the qualities of what he terms “documentary display”, such a decision does appear apt. In summary, Documentary Display is an often-fascinating and routinely engaging exploration of the outer reaches of documentary practice, providing a cogent argument for the necessary expansion of what can and should be considered documentary cinema. Documentary Display: Re-Viewing Nonfiction Film and Video, by Keith Beattie, Wallflower Press, London and New York, 2008. 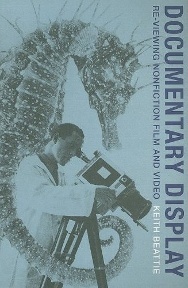 Keith Beattie, Documentary Screens: Nonfiction Film and Television, Palgrave Macmillan, Houndmills, Basingstoke and New York, 2004. See Bill Nichols, Representing Reality: Issues and Concepts in Documentary, Indiana University Press, Bloomington and Indianapolis, 1991.